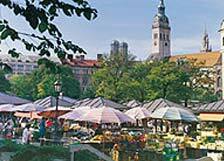 The Viktualienmarkt has been open since 1807 when it opened as a small herb market. Over the past 200 years, it has developed into one of the city's biggest attractions. The location, just off Marienplatz, is perfect for attracting locals and tourists alike to its array of fruits, vegetables, flowers, all kinds of meats and cheeses and much more. There are some stands to get some tasty soups and snacks and, in typical Bavarian style, the whole place revolves around a beer garden that is marked by a traditional maypole with its characteristic blue and white stripes. You'll also find a number of fountains in the area that commemorate local comedians like Karl Valentin and Liesl Karlstadt.